The day was hot; the sky deep blue almost without clouds. 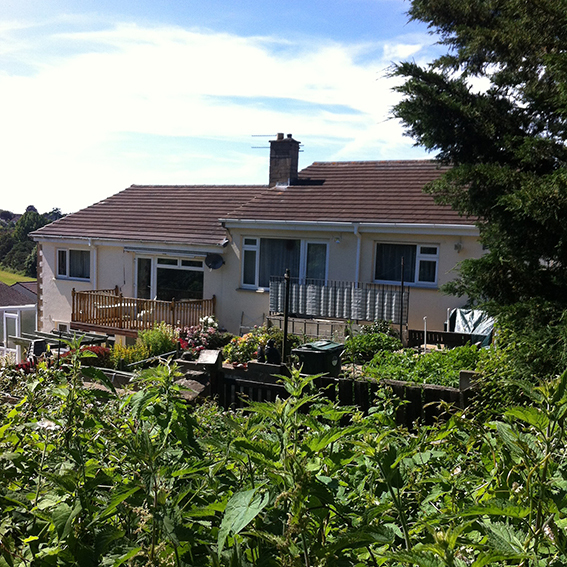 We parked in a housing estate at the highest point of Chippenham and followed a narrow alley between the houses which opened up into a track, overhung with nettles, with a wooded area on one side and bungalows with striped awnings pulled out against the sun on the other. The track led down to a managed grassy plain; beyond, hidden by trees: the River Avon. 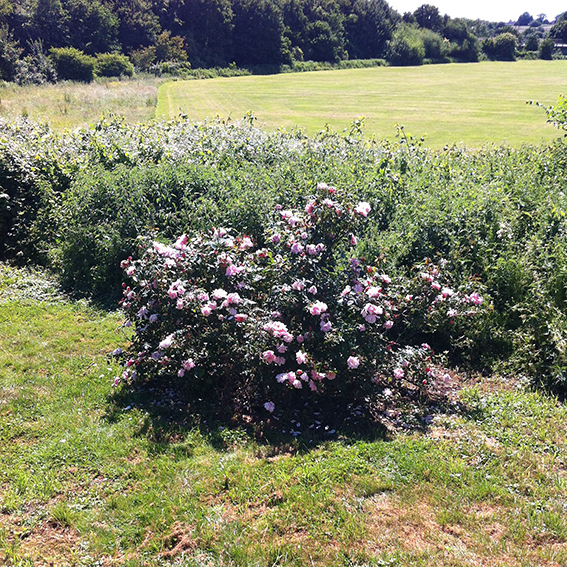 We descended between a mixture of wild and cultivated shrubs; a large rose bush with rich pink flowers growing on a circular patch of cut grass, enclosed by a bed of nettles. We crossed the plain to reach the river; this was common land and maintained by the council; the grass kept short, and a well defined path next to the water. A cyclist covered in black, including helmet and glasses, decorated with yellow flashing sped by, baring his teeth in a smile. The water was a warm brown in the sunlight; there were small fish, water weed lay in long thin strands, damsel flies, Prussian blue wings, moving in and out of the light above. 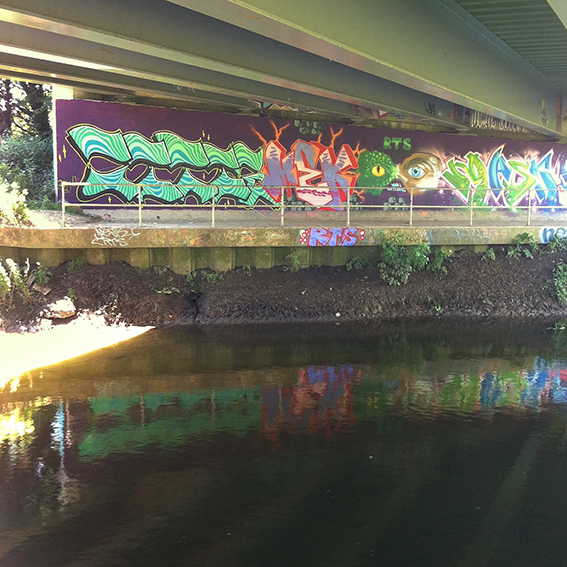 Pristine graffiti on the walls under the bridge. We took another path cut through the tall grasses and plants growing next to the river, defined by the route the mower had taken. Across the river was Rowden Manor and beyond were the fields which sloped down to the Pudding Brook as it made its way through the shallow valley towards the river. Mostly the edges of the river’s banks were overgrown with trees or wide bands of grasses, nettles and cow parsley; at various points access paths had been cut through so people could get down to the water’s edge. On our left the flat plain had a new plantation of trees; each sapling, hazel or oak, with a protective pale green plastic tube. The mown path diverged, going up towards a tarmac road and down towards Mortimores Wood; a strip of ancient woodland, dating back to the twelfth century and originally part of the Royal Forest of Pewsham, which had been preserved and managed. (1) We entered the wood; mature oak trees spread out over the footpath and further on younger coppiced hazel sent up new straight branches. Bracken grew on the higher ground and below us lay the river. The tree canopy was dense enough to provide cool shade, and the light when we emerged seemed all the brighter and the colours more bleached out. Despite being very close to the river it was impossible to see anything but foliage on the opposite bank and the higher land behind because of the tall grasses and nettles. The area beyond was interesting however because over there was a stretch of the Pudding Brook we had walked earlier and also the point where it turns to head towards its confluence with the River Avon. We had not seen this yet but we knew that the Pudding Brook entered the Avon opposite the Chippenham Sewage Treatment Works, situated next to the river bank. We were back on the mown path, with tree planting on both sides and opportunist plants such as cleavers and nettles growing up between the young trees. The path turned and crossed a lane ending in a metal gate finished off with three strands of barbed wire at the top: the sewage works. Behind the gate there was a yard with single-storey red-brick office buildings and workshops; behind them the low circular treatment beds. There was a sign saying that the gate should be kept shut at all times and that cctv was in operation. On the satellite map the lane appeared to run through the trees between the sewage works and the river but in reality it was there to serve the sewage works and it ended at the gate. Just before the entrance a small stream went under the lane to empty itself into the Avon. To the right of the gate was an overgrown fenced off area leading to the river and on our left the mown path continued. I knew that the Pudding Brook met the River Avon opposite the sewage works but from this end it was impossible to get close enough to the river to see. The map indicated that it might be possible to walk through the fields along the edge of the sewage works and gain access to the river from the other side of the buildings so we continued along the mown path. There was a slight incline with young trees planted on one side, wild blue geraniums and cow parsley growing amongst them, and fields on the other side. 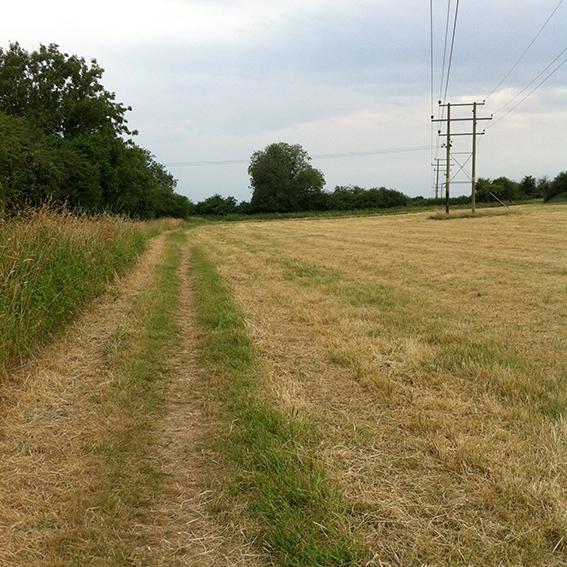 It was still hot; the cut grass had dried and sent up a sweet smell as we walked over it. A dense line of trees edged the field, but we slipped through a gap into a piece of open and undulating land divided by low hedges. From where we stood the land sloped down, the fields we saw were more carefully managed than most of the land around the Pudding Brook; hedges were thick, trimmed, possibly recently replanted and the gates were new silver metal. We walked down the edge of the field – dusty pink soil with young green shoots. 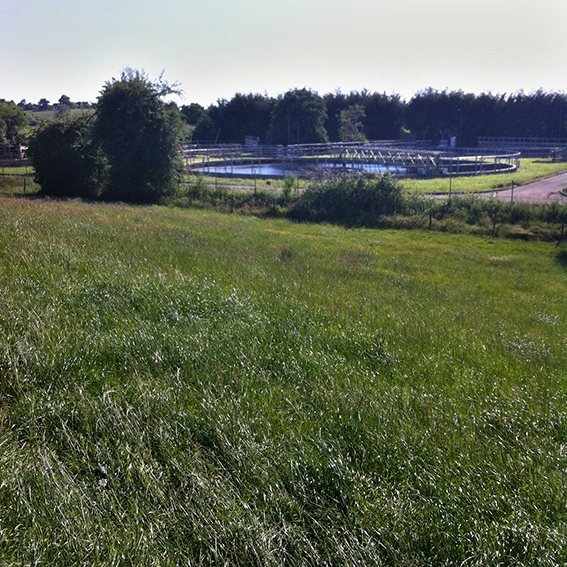 At the bottom of the field was the stream which flowed past the entrance of the sewage works. We climbed a gate into the next field; the grass was cut like a lawn, the lower leaves of an oak tree worn away at grazing height, its shape dark against the blue sky. The top hedge, growing on a bank, shaped and trim, below it the pink soil, compacted like stone, with rabbit holes like small caves. Here the land was open to the sky, smooth curves of rounded slopes barely interrupted by trees or shrubs, the yellow of the stubble against the flat blue of the sky. 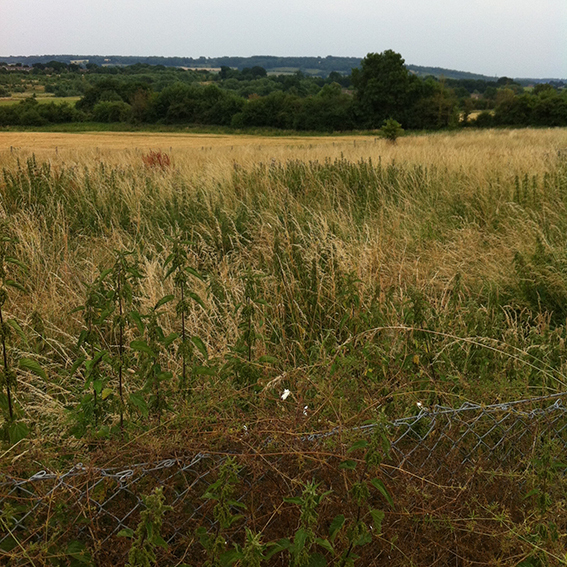 We headed down the side of the field and climbed another gate into the meadow running alongside the sewage works, separated from it by a high mesh fence. We kept to the hedge line which was on higher ground, walking through knee high grass striped red with seed heads. Buttercups were abundant. Looking down we could see four circular structures – the treatment beds – and some green cylindrical towers with domed tops. A flight of mallards took off as we approached. We were hoping to walk down the short side of the sewage plant to reach the river but we got near enough to see that there was a dense network of thorny shrubs growing there. Our other option, to cross into the next field and then walk to the river was not possible because there were black cattle there. Some of them were already aware of us, their heads over the fence; as we neared those in the background, resting, sensed that something was happening and joined the others until the fence was lined with bristling black heads, ears out, and an excited, and possibly belligerent, lowing had begun. On arriving back at the sewage works we saw that the gate was open and the yard accessible, a blue van parked there, a man sitting at the wheel. The part of the yard adjacent to the river had some small brick structures, like loading bays, and then a thin covering of trees before the river. The structures, by my calculations, were probably directly opposite where the Pudding Brook joined the river. I asked if we could go over there and take a look but it was not allowed and we were advised to return in the morning when the boss might give us permission. We returned to the lane which followed the dense strip of foliage next to the river bank and trampled through the nettles to look over to the opposite bank. There we could see a divide, a darker furrow, in the strip of greenery sloping down to the river, which might be where the Pudding Brook ran down. On our left the plantation led up to the fenced off area of trees; carefully we stepped through the nettles and cleavers between the rows of saplings, and over a broken fence topped with barbed wire into the shade beneath the trees where cow parsley leaned down or lay dried out on the ground. Hazel trees and a mass of brambles grew at the edge of the bank; through the bright green foliage we could just see the gleam of the water a long way down below. The opposite bank was also hidden from view; the foliage hung too far out over the water to pull aside and we were not able to see the Pudding Brook's meeting with the River Avon though we were standing yards away from it. We made our way back and took the mown path, stopping to rest and look across at the flat plain which was divided by the Pudding Brook on its way to the river. We took a lower footpath through the wood bordered with the large dusty green leaves of burdock, no sticky burrs yet, and followed the river path back to the common ground, where people were now sitting, small shapes on the expanse of green, then up the hill and back to the houses where the car was parked. Bungalows next to the track leading down towards the River Avon. Common ground on the outskirts of Chippenham. The River Avon behind the trees. Cultivated shrub growing next to the track. Bridge over the River Avon next to the footpath. The River Avon flowing by Mortimores Wood. 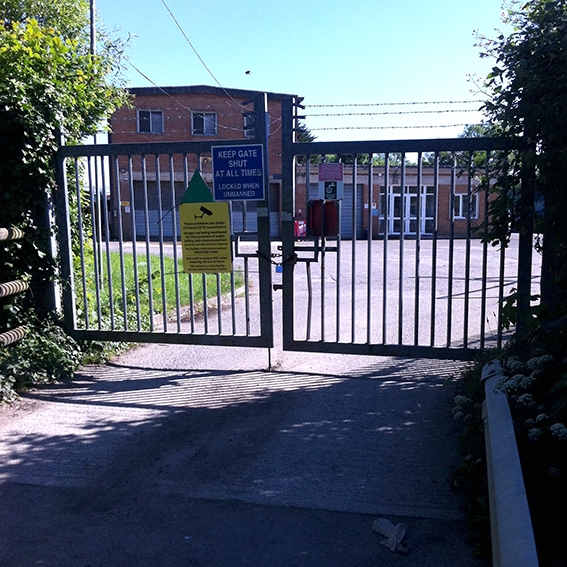 The gates of Chippenham Sewage Treatment Works. Meadow next to the sewage works. The River Avon, obscured by foliage. The flat plain on the opposite side is crossed by the Pudding Brook. To find the confluence of the Pudding Brook and the River Avon. The day had been hot and the air was heavy and warm. We parked at Rowden in the hospital car park, next to the chemist – closed for the day. From the hilltop the land sloped down and spread out into a wide plain crossed by the River Avon. The chain-link fence had been bent over at the top and a footpath led down the hill. Though it was early evening it was hot on the lower ground. The recently mown grass was dry, pale cream and golden brown coloured. We crossed a tarmac path with a neat strip of grass, also cut, about a foot wide, growing up the middle, climbed over a stile and crossed a piece of common ground, guessing the route of the footpath. Tramplings in the long grass in front of a hedge indicated where the path continued and once inside the hedge, there at our feet, was the boardwalk – a narrow raised platform leading over the boggy ground in the field. Tacked on to the wooden planks and running the whole length were two thin strips made of a gritted fabric, coated in tar, which had set to form a surface which would be less slippy than the wood when the planks were wet. We entered the field which was small and enclosed on all sides by high hedges and trees; just visible above the long grass was the pointed brown face and horizontal ears of a deer: it jumped up, bounded across the field – paused so we could see its whole shape in profile – then trotted into the next field. The sedges around the boardwalk grew tall and abundant, meadowsweet and hogweed even taller in between, the hogweed dropping its white disc-shaped seeds. All of it imbued with the perfume of the overheated tar strips. Ahead in the shade beneath the hedge was a white metal gate leading to the bridge over the Pudding Brook. We crossed and turned left to where the brook headed towards the River Avon. Here the nearest banks were about four feet high but the opposite ones were higher – about six feet – and, for all the length of the brook as far as we could see, covered in a thick expanse of nettles. This cover extended like a field beyond the bank and from past experience we knew that the river was similarly surrounded; this being what had impeded our progress last time. The brook was only about a foot wide. We wondered if it had been deepened, to channel the water; its banks, at their lowest point, being very regular as if dug out by a spade. We followed the barbed wire and post fence along the bank. We were in a field which ran the length of this section of the brook. The grass was short – having been grazed by cattle – only thistles flourished, bushy, not yet at their full height. Cows appeared through a gap in the hedge at the top of the field, possibly returned from milking. We continued. Now we could see the course of the River Avon, marked by a dip in the expanse of nettles spread out below the trees, dense and full of leaf, and beyond: the red-brick buildings and towers of the sewage works. We walked a bit further and there curving into view – a bright glimmer of blue water between the nettle-choked banks – was the River Avon. The opposite bank leaned high above, overhung by trees; the river bed was more of a bog, a water garden; large clumps of black-stemmed reeds with dark cream flower heads growing tall, bending slightly, flourishing prolifically. Below the spiked metal fence of the sewage works there were four terraces: yellow leaved shrubs, darker nettles, grasses – creamy seedheads waving – then the black-stemmed reeds. The side we stood on was not so high as the other; thistles grew in the dry grass, the tops of their flowers purple tufts. In parts the crumbling, grass covered clay led down to the water. Then small trees and shrubs took over the bank, and the river, now green with water weed, deepened, turned, and disappeared round the bend. On our left the narrow ditch of the brook widened, the banks lowered and the Pudding Brook, now flanked by river reeds, merged with the River Avon, its water picking up the same blue reflections. We made our way back. The cattle had moved on; there was just one cow, alone, pulling hay from a pile shaped like a termite mound in the corner of the field. It was almost dark as we headed back up the hill to the car park. Ahead of us the chemist's sign was lit up: Lloyds Pharmacy. The sloping field leading down to the plain. The Pudding Brook flowing through a wooded area amongst the fields. The Pudding Brook. On the right – the field and on the left below the trees – the River Avon. The Pudding Brook approaching the River Avon.The sewage works at the top of the bank. To follow the River Avon upstream to where it is joined by the Pudding Brook. All day the sky had been cloudless, the temperature high; even later the air was warm and there was no breeze. We drove along Patterdown and parked in a small lay-by just before the junction with the A350. From here – on the map – it was a short walk across the fields to join a footpath which followed the the River Avon, the same path along which we had approached from the north the previous week. We walked along the roadside verge through tall dry grasses and cow parsley – gone to seed – climbed a fence and entered a field. Sheep wandered off as we approached. The grass was short having been mown. We made our way across to the next field, recently ploughed, with docks flourishing all over the fresh furrows like a crop. Further along a pheasant, so close we could see the markings on its tail feathers, flew up from the grass, its panic cry disturbing the heavy air. The land ahead flattened out and we could see a winding belt of trees marking the course of the river. We crossed a wide grassy ditch and passed through a field entrance without a gate; in the short grass stood a pylon, and beyond a small willow, then an irregular line of nettles and shrubs on top of the river bank. We were standing in a loop of the river, almost surrounded by its curve. It bent around the plateau where we stood, then doubled back on itself and continued to flow south. The water was low, the banks exposed, pale pink and dry from the heat of summer; nettles and other plants, foliage sparse and raggy, growing up from the waters's edge – all shot through for a second by the flight of a kingfisher. Here the banks were less overgrown and we could get near enough to see the river – hardly moving – the water bright where it reflected the sky, deep black in the shadows of the trees. Water plants flourished; reeds with brown seed heads, plants with large oval leaves just below the surface of the water, golden yellow flowers balled up, not fully open. We followed the river upstream. On the opposite side, firstly, there was a flat plain; cattle grazing, more pylons, then the trees closed in and the opposite bank became higher. A large heron flapped away making its hoarse cry. The tops of the buildings of the sewage works could be seen above the tiers of foliage – bushes, nettles, reeds, sloping down to the river. There was a dark green cylindrical building with a conical roof and steps leading to a platform at the side, further along, and lower, a Portakabin with two square white-framed windows, all fronted by a high metal mesh fence. Along with the smell of human waste there was a synthetic perfume in the air. We climbed a stile into the field we had been in the previous week; stretching across was the broad swathe of nettles with the dark furrow down the middle where the Pudding Brook flowed. As it neared the river the brook widened and reeds from the river grew up amongst the nettles. There was a patch of low water, bright blue, then the brook deepened and became part of the passing movement of the river. We watched for a while. Another heron crossed the sky. The sun was low and the air was cooler now. 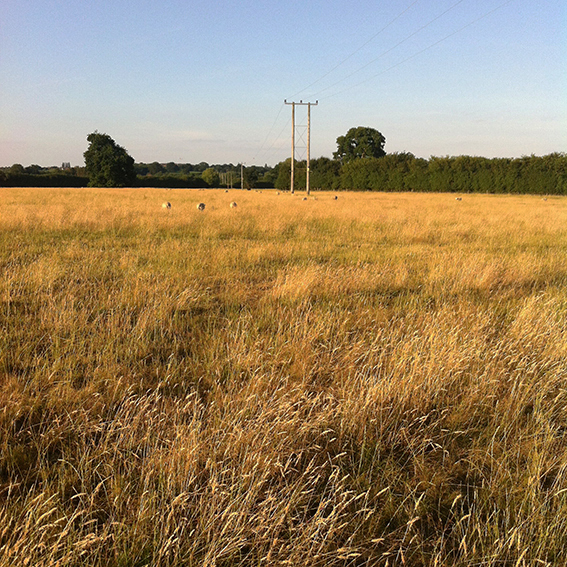 We walked back across the fields, mostly short grass, in some parts surprisingly lush. Two partridges flew up from below the hedge and settled on the ground further away. By now the sun had set; the light faded. There was a rasping sound – repeated – possibly an owl. In the next field, the sheep – blurred pale shapes against the dark yellow of the grass – again the rasping noise, a chirring sound, repeated, could it be a sheep breathing ? The sheep moved off and still the noise came from the tufts of cut grass lying on the ground. Then, very near by, a small light brown bird flew up and into the trees, barely visible. It seemed possible that owls were feeding their young and the parent had flown away to detract attention from the chick on the ground. We skirted around it and continued across the field, climbed the fence and walked back to the lay-by which was now occupied by another car, red brake lights glowing. Field next to the A350. Field of dock. In the distance the River Avon. Field next to the River Avon. The meander of the River Avon. Looking upstream. The River Avon at its fullest in the dry summer of 2018. The River Avon flowing past the Chippenham Sewage Treatment Works. The Pudding Brook, flowing in from the left, meets the River Avon.